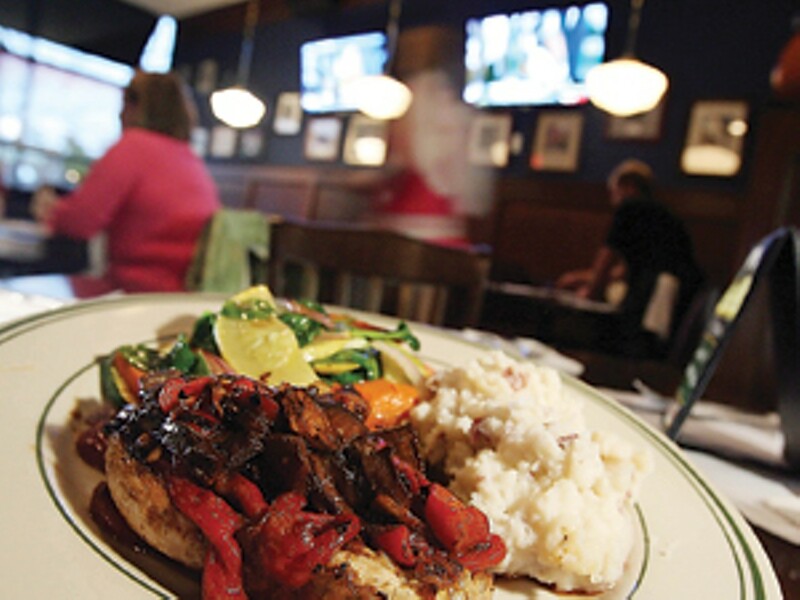 BlackFinn began its corporate life in 1994 as an Irish pub, but the only remnant of those origins is the Guinness sauce and marinade that appear on several dishes and the Bailey’s Irish Cream that enhances a mousse. Referred to instead as “an American saloon,” the pub theme is emphasized on the walls in vintage photographs of celebrated saloons. The sprawling, boisterous lounge and the much more sedate dining room, which seat around 120 people, feature the sort of dark wooden tables and walls that one would expect to find in the classic urban tavern, although with more than 20 flat-screen TVs. The substantial appetizers average around $9, including a pulled pork sandwich and three chicken and three steak skewers. Along with chili and a soup of the day, BlackFinn offers New England clam chowder chock-full of potatoes and clam bits. Some sauces overwhelm the entrees, but the honey-dill glaze on the Atlantic salmon ($16.99) served with rice pilaf is just about right. Among the desserts, there is a bit of the Irish in the luscious dark chocolate mousse laced with Bailey’s, served in a tall glass. And the small 25-bottle wine list will appeal to penurious tipplers with relative bargains.